I must start with an apology. I apologise for not writing any Elitistreview posts for far too long; unsurprisingly I have an excuse. Two months ago I had a fit and collapsed into a quivering heap on the floor right on top of my left foot and ankle. I totally buggered them. So for the last two months I’ve been in so much pain I have been unable to concentrate on anything for long enough to write a tasting note. Moreover, I have been prescribed an awfully large amount of morphine and Tapentadol to deal with the pain. Sadly, taking these leave me as mentally incapacitated as someone who drinks minor classed-growth Bordeaux on a regular basis. With my mind crippled by pain and sodding awful drugs, together with the spectre of depression lurking about because of these, taking to the keyboard and writing with my usual degree of humorous invective was simply right out. However, I thought, after such a prolonged silence, I should gather all my strength and write something to let you know that Elitistreview still lives and expound on a subject I feel strongly about. I feel a close association with this producer as he was one of the people my blind-tasting team and I visited on our first trip to Burgundy, nearly two decades ago. Back then he made good, but distinctly rustic, Burgundy. 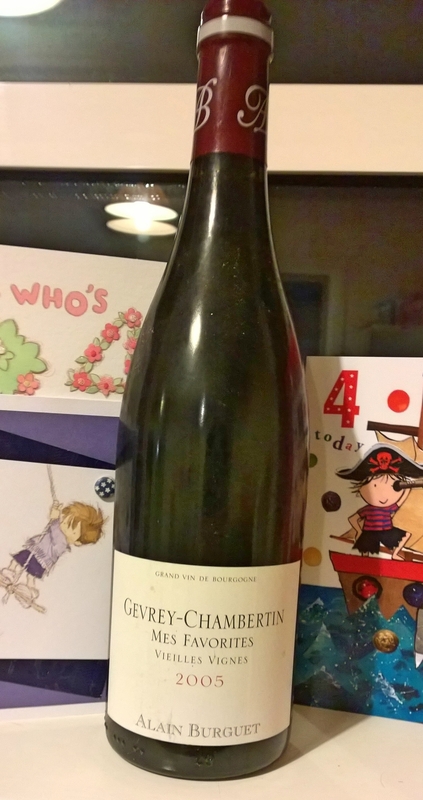 He was certainly a jolly nice chap and that, combined with the quality of wine, made me a regular customer of his – this old vines cuvée especially. I always thought his wines would best be drunk young, as the obvious Brett in them, leading to massive bottle variation, as well as his oxidative wine-making style would not lend themselves to making age-worthy wines. Even though his sons have cleaned things up considerably in recent years, The Editor and I were sensible and responsible enough to drink most of the six bottles we bought within six months of us receiving them. Sadly, one bottle of it somehow made it into our long term storage cellar, and was only returned to us a couple of weeks ago by a kind friend who braved the chaos of our cellar to get us a case of general drinking wine. Alas, this bottle showed that Burguet wines of this period were still not made for ageing. It shows pronounced oxidised notes on the nose, together with the stinky, unpleasant characteristics of Brett. there was some fruit on the nose, but even that seems more than a little rotten and generally shagged out. The palate was oxidised, full of nasty Brett, with only the tiniest remnant of rancid fruit, a cruel mockery of the delicious fruit it possessed in its youth. This wine provided no pleasure at all, indeed we did not finish our glasses. The less than sanitary wine-making which included a lot of oxygen contact has made this wine dead and not worth drinking. Indeed, it is hard to see how anyone could find this wine worth drinking, not even an alcoholic in extreme desperation. Like the vast majority of Burgundies today, this was for drinking young and it should have disappeared down our throats seven years ago, when it was very nice, rather than into our long term cellar, only to emerge to give us a very bad time. It is possible that now that M. Burguet’s sons have almost completely taken over the wine-making the wines might be cleaner, and that after having dragged their cellar management from the 19th into the 21st century, they might have done enough to make the wines better able to age. But why bother? The most recent Burguet wines I have tried have been delicious and why take the risk of losing that? Most modern Burgundy, of any quality level, is simply made to give most pleasure soon after release, so that is when you should drink it. Cellaring all to often is an exercise in perverted self-punishment, which ends up hurting not just you but whoever you choose to open the bottle for. I am sorry to hear that you were in such great pain and glad that you now feel well enough to write. Hope that your recovery continues. Sorry this turned out so bad, David. I think I have a bottle of the ’09 lurking in my wine fridge. Better drink it up. Nice to see you back writing. You haven’t lost your touch, and your posts are fun even when the wines are not. Hope to see you when next in Blighty. What a pleasure to see another review, David, they were much missed. I’ve drunk plenty of this wine, mostly from 1988-1996,and it has generally aged very well indeed with the exception of the 1990. I foolishly finished this up on the grounds that it wasn’t very nice, which is of course a ridiculous thing to do. I wonder if it ever came around? I’ve not been enjoying the 05s that I’ve come across recently at all. I’d assumed that the majority have entered a long closed period but it occurs to me that this is a concept which might not meet with your full blessing. Much has changed this millennium in Burgundy and I think you may very well be right in thinking that the wines are now best suited to youthful consumption, in which case I am glad that most of mine is older than that on the grounds that lovely as the fruit in young wines can be it is not what I pay all that money for. The one thing I have observed is that one can’t tell the future from the fact that a burgundy tastes tired, washed out, reedy and generally crap. I have seen enough hideous ducklings become magnificent swans to be sure that what seems intuitively obvious isn’t necessarily true, so I would guess that it’s at least possible that this wine will reemerge in splendour. I don’t know. And given the oxidation you tasted could it be that the cork was unsatisfactory? Welcome back! Oh dear – what a shame that this should be the first wine to greet you after your absence from writing – but I think I sometimes enjoy the less positive reviews more – as they’re the evidence of your candour and lack of self-censorship, which is all too rare these days. But please drink something nice and give us more words relating to the more interesting parts of our anatomy! Of sorry chaps, Elitistreview didn’t tell me is had comments and I’m ‘not feeling at my best’ so I hadn’t dropped by the site for a while. Tom, I have had much experience of wines going through closed periods from which they later blossom, but some are just downright nasty once you’ve let them hang around for too long and I’m distinctly sure this is such a wine. There were no problems with the cork, it was in fine nick, the problem rested with the wine. I’ve heard people say that wines can age through oxidised periods, and even that oxidation can ‘blow off’ a wine. My, admittedly shorter than your, experience makes me think this is crap as I’ve never witnessed a wine that’s done it. Wine with the capability to age long term is simply quite a rare beast these days, and unless you have advanced precognition skills it’s generally not worth taking the risk. Agers do exist, though, and they are not always the most expensive, rarified artifacts. I tried a cask sample of Champy Beaune aux Cras 2012 at an en primeur tasting and actually purchased a few bottles because (after I’d tasted another bottle, I admit) I felt that was a wine with a definite future. I can see it turning our like one of the lovely, sculpted, soft little charmers that some wines from Beaune from the 70s, 80s and 90s one can still sometimes serendipitously encounters. Not having one in front of me, and being depressingly incapacitated by medication, I cannot quite put my finger on the qualities of quite a lot of Beaune wines that actually improve over the long term, whilst flashier, excessively-expensive superstars from more highly thought of villages just decay into insipid filth. I’ve been wanting to get that rant out for ages! David,I certainly don’t think that wine-or at least red and white burgundy-can shed oxidation, which is why I did wonder whether it was a bad bottle-can one necessarily tell this from the state of the cork? I’m absolutely with you on Beaune, almost the last village in Burgundy to remain affordable and by no means a poor relation. I wonder if you are right about wines generally no longer having the capacity to age. Certainly I am disturbed by modern notions of ‘tannin management’. Welcome back, David! Yes, much, much missed. I’d rather read your description of a bad wine than just about anyone’s description of a fabulous one…but here’s to your describing the latter again very soon. Take care with sudden movements on that ankle–alas, I speak from similar experience.